Synthetic peptide from human NPY2R. 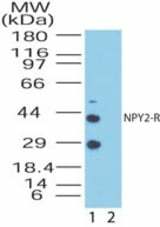 NPY2R antibody was raised against synthetic peptide from human NPY2R. Small volumes of anti-NPY2R antibody vial(s) may occasionally become entrapped in the seal of the product vial during shipment and storage. If necessary, briefly centrifuge the vial on a tabletop centrifuge to dislodge any liquid in the container`s cap. Certain products may require to ship with dry ice and additional dry ice fee may apply. NPY2R belongs to the Neuropeptide Receptor GPCR family. 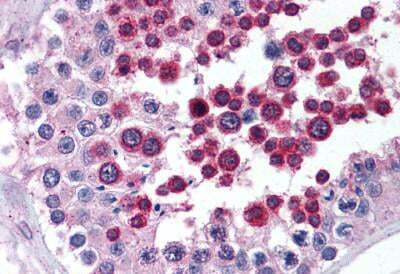 Anti-NPY2R antibody IHC of human testis. Immunohistochemistry of formalin-fixed, paraffin-embedded tissue after heat-induced antigen retrieval. Antibody concentration 10 ug/ml. NCBI/Uniprot data below describe general gene information for NPY2R. It may not necessarily be applicable to this product. NPY2R: Receptor for neuropeptide Y and peptide YY. The rank order of affinity of this receptor for pancreatic polypeptides is PYY > NPY > PYY (3-36) > NPY (2-36) > [Ile-31, Gln-34] PP > [Leu- 31, Pro-34] NPY > PP, [Pro-34] PYY and NPY free acid. Belongs to the G-protein coupled receptor 1 family. 1. Data indicate modest association of the age at onset (AO) with two neuropeptide Y (NPY) promoter variations and a highly significant association with NPY receptor NPY2R promoter single nucleotide polymorphism (SNP rs2234759).